Talking about Death is a classic guide for parents helping their children through the death of a loved one. With a helpful list of dos and don’ts, an illustrated read-along dialogue, and a guide to explaining death, Grollman provides sensitive and timely advice for families coping with loss. 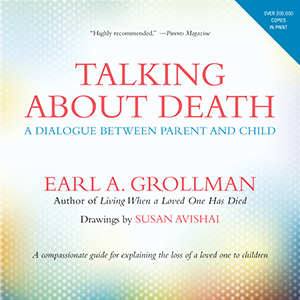 This redesigned and updated edition explains what children at different developmental stages can and can’t understand about death; reveals why it’s crucial to be honest about death; helps you understand the way children express emotions like denial, grief, crying, anger, and guilt; and discusses children’s reactions to different kinds of death, from the death of a parent to the death of a pet.